We offer a top of the line oyster to the most discerning of palates. Many an oyster aficionado will choose our oyster over other world class oysters. Our oysters are noted for their Umami or savoriness; they have a buttery mineral rich taste with a crisp light finish and the right amount of salt. Our farm is ecofriendly. Shellfish aquaculture is sustainable. No fertilizers, feeds, herbicides, drugs, or chemicals are used in the farming of our oysters. Our oysters are produced using only hatchery produced seed and are responsible for the production of billions of spat which can then go on to help repopulate the wild oyster in the Bay. We also collect the empty shells from the restaurants to be used by the Chesapeake Bay Foundation as part of their "Save Oyster Shell" program. Why are Oysters good for the environment? Oysters feed on microscopic plants which are overly abundant in the Chesapeake Bay, thus improving water quality. Oyster farming provides habitat for fish and improves species diversity. Oyster farming removes nitrogen. 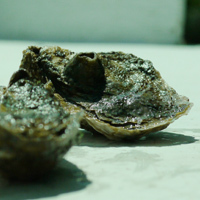 Oysters improve light penetration which helps the Bay's grasses recover.